Diego Costa: Does the Chelsea striker have a softer side? Chelsea's Diego Costa is serving a three-game ban after being suspended for his confrontation with Arsenal's Laurent Koscielny in the Blues' victory at Stamford Bridge last weekend. It is the latest in a long line of controversial incidents that have dogged the explosive striker throughout his life in football, from humble beginnings in Brazil to superstardom in Spain and the Premier League. But what makes Costa tick? Why does he attract so much trouble? And is there another side to his personality? To understand Diego Costa the man, we have to return to the beginning and look at Diego Costa the child. His life started in Lagarto, a poor town of 100,000 people in eastern Brazil, where his football-mad father, Jose de Jesus, named him Diego in honour of Argentine legend Diego Maradona - he also has an older brother called Jair, after Brazil's flamboyant 1970s winger Jairzinho. Unlike many of their neighbours, the Costa family did not live in poverty because Jose de Jesus always worked, but life was tough and the brothers soon learned to fend for themselves when they weren't helping their father with his agricultural labour. Looking back on those early days for a documentary made by Spanish TV network Canal Plus last year, Jose de Jesus recalled that his youngest son was a bundle of energy. "He was electric, anxious, he didn't stop…he always had an aggressive manner," he said. "More than once, things ended with a fight." He was also very good at football, using his powerful physique to impose himself on the opposition. But Lagarto had no sporting facilities, no grass pitches and no youth team clubs providing organised football, so the only way Costa could learn how to play was on the street. And the streets of Lagarto had their own rules. In a rare and revealing 2012 interview with Spanish newspaper El Pais, Costa reflected: "I fought for everything, I couldn't control myself. "I insulted everyone and didn't have any respect for the opposition. I thought I had to kill them…I got very heated. I got used to football where the biggest ones threw their elbows at the others, and I thought that was normal." Despite spending so much of his youth kicking footballs on the streets of Lagarto, the fact he had never played an organised form of the game meant that by his mid-teens Costa was not seriously considering turning professional. He was, indeed, more interested in getting a job so he'd have enough money to take girls out for dinner, and he started travelling to the Paraguayan border to pick up cheap fake brands and sell them at a shopping centre. By then, he had moved away from Lagarto to live with his uncle Jarminho in Sao Paulo and, recognising his football talent, Jarminho persuaded his nephew - by paying him - to join a youth team, Barcelona Esportivo Capela, at the age of 16. Costa had ability, but street football had left him very rough around the edges. Before long his indiscipline got him into trouble, as he later recalled. "They gave me a four-month suspension for slapping an opponent and going after the referee when he showed me the red card," he said. But one day an associate of super-agent Jorge Mendes came to watch Costa, and the ban was magically lifted. He played, impressed the watching scout and was promptly sold to Sporting Braga in Portugal. First, though, he had to persuade his parents, neither of whom wanted to see their 17-year-old son move to another continent. His mother Josileide recalled: "It was a terrible debate within the family. But he said: 'If you don't let me leave, I will escape. I have given my word, and I am going.'" Stubborn, ambitious and independent, Costa was heading to Europe. But Costa's arrival in Europe proved no fairytale success story - his route to the top was anything but easy. After a month, in fact, he wanted to return to Brazil. But despite his son's regular tears of homesickness, his father, now convinced that Diego had a promising career ahead of him, persuaded him to stay. Dad was right. Within two years Costa had done well enough in Portugal to attract Atletico Madrid - with help from the ever-influential Mendes. But the forward positions there were occupied by Sergio Aguero and Diego Forlan, and Costa had no hope of displacing them so he was sent out on a series of low-profile loans. In his first three years in Spain, Costa spent time with Celta Vigo, Albacete and Real Valladolid, making the headlines as much for occasional disciplinary lapses as his goalscoring feats, which were modest. At Valladolid, however, he met perhaps the first man capable of toning down his aggression and channelling his energy in a more positive manner: the team's manager, Jose Luis Mendilibar. The man who Costa describes as a father figure subsequently explained that Costa's aggressive approach and his early struggles in Spain helped to define him as a player, saying: "He has an edge but all strikers need that and he is clever with it now. "Nobody has ever given him anything, and that has made his personality." After eventually returning to Atletico, Costa started to become better known - but still largely for his physical confrontations with opposing defenders. He enjoyed some notorious tussles with Real Madrid's Sergio Ramos, for example, but perhaps his most infamous feud was with Real Betis defender Antonio Amaya in January 2013. When they met in the Copa del Rey, a mistake from Amaya allowed Costa to score and the striker celebrated by gleefully thanking the Betis defender for his 'gift'. The pair had to be separated by their team-mates at the end of the game, and former Wigan man Amaya raged: "If they hadn't held me back, I would have killed him. It says a lot about what kind of person he is. He has no heart." Amaya took his revenge two weeks later, spitting in Costa's face during a league meeting in which the Atletico striker scored the only goal. By then, Costa was finally becoming an important player for Atletico and he took another great step forward in the summer of 2013, when Radamel Falcao was sold to Monaco and manager Diego Simeone made Costa the new focus of the team's attack. Until that point, Costa had never scored more than 10 league goals in a season, but he relished the extra responsibility and proceeded to play a vital role in Atletico's hugely unexpected La Liga title triumph. Just as important as his 27 league goals - nearly a threefold improvement on his previous best - Costa's aggression allowed him to become the team's symbolic leader, epitomising their combative style, often described as 'holding a knife between their teeth'. At the end of that spectacular season, the Mendes link again resurfaced as Jose Mourinho - another client of the super-agent - lured Costa to Stamford Bridge, and the Premier League has since become accustomed to his occasional tendency to let the knife slip. An aggressive presence on the field, Costa has pursued success no less determinedly off it. Perhaps the starkest demonstration of his professional ruthlessness came in 2014, when was he persuaded by Spain boss Vicente del Bosque to pursue an international career with his adopted nation before the World Cup finals - in Brazil. The sight of a 'traitor' appearing in enemy colours on his former home turf enraged many Brazilian fans, and Costa knew that he was setting himself up to receive venomous criticism from host supporters throughout the tournament. But his mind was made up. The prospect of being abused by his countrymen was not enough to put him off the potential rewards he could derive from turning his back on Brazil and siding with Spain. As ever, Costa's ambition made the decision for him. 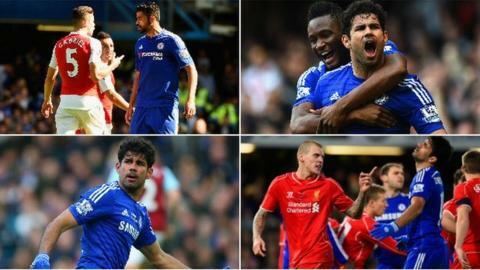 Costa, then, has always possessed all the ingredients to become one of football's biggest bad boys. But there is another, softer side to his character. Friends and family insist that off the pitch he is quiet and gentle - his former team-mate at Celta Vigo and Atletico Madrid, Mario Suarez, said: "In the dressing room he is super-calm. On the pitch, he transforms into the Diego Costa the world knows." He is also loyal and generous, demonstrated by his decision to start a soccer school in his old home town of Lagarto, giving youngsters who dream of following in his footsteps the opportunity - one he was denied - to learn the game in proper surroundings. More than 200 children from Lagarto now regularly attend free of charge, with all the costs met by Costa. His friend Junior Menezes, who helps him run the school, told Canal Plus: "We thought we could help people who have no dreams and no direction, who need help the most. Kids who can't even buy a pair of football boots. "Our only condition is that they have to be studying. Diego repeats these words a lot: I want to develop good citizens." The snarling, growling, elbowing Costa selflessly helping to develop good citizens? There are two sides to every story.